The Green Party will announce three policies aimed at students at an event in Sheffield today (April 26). 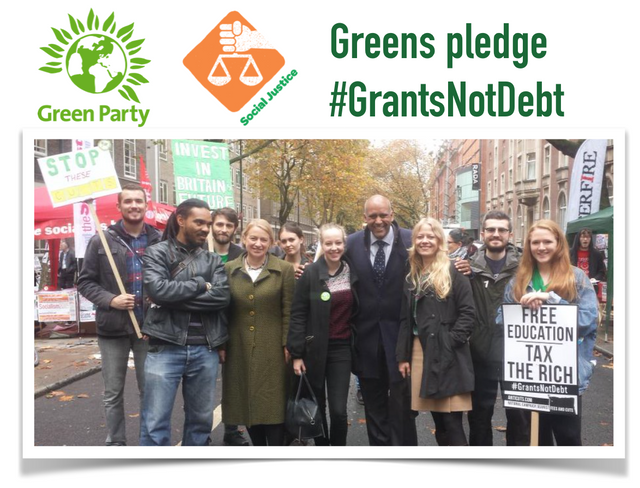 “The Green Party is the only party standing up for students and putting young people at the heart of its campaign. Education is a right not a commodity to be bought, and we need a level playing field so everyone can go to university or college, not just the most privileged." "If we took a young person from Brent of a black or minority background and compared them with another young person of a similar background in the majority of other places in London- the Brent young person would be doing worse compared to white British peers, - the other doing better. Research from Runnymede shows young people in Brent are hitting a financial barrier, partly due to the borough they live in which is causing disadvantage. Green policy to remove the burden of debt and investing in young people could help shift the balance." The policy launch is at 12 noon, April 26 outside the Information Commons, University of Sheffield, 44 Leavygreave Road, Sheffield S3 7RD. Costs: The Green Party would fund the reintroduction of Education Maintenance Grants (approximately £560 million per year), the ending of tuition fees (approximately £8bn per year), and covering the cost of Erasmus (approximately £6bn per year) through the introduction of a Wealth Tax (generating £10bn in its first year) and Robin Hood Tax (generating £5bn in its first year) and the scrapping of HS2 (£66bn) and the third runway at Heathrow (£17bn).